The post Audition :: Night Watch appeared first on Chapel Street Players. The post Audition :: The Lion In Winter appeared first on Chapel Street Players. 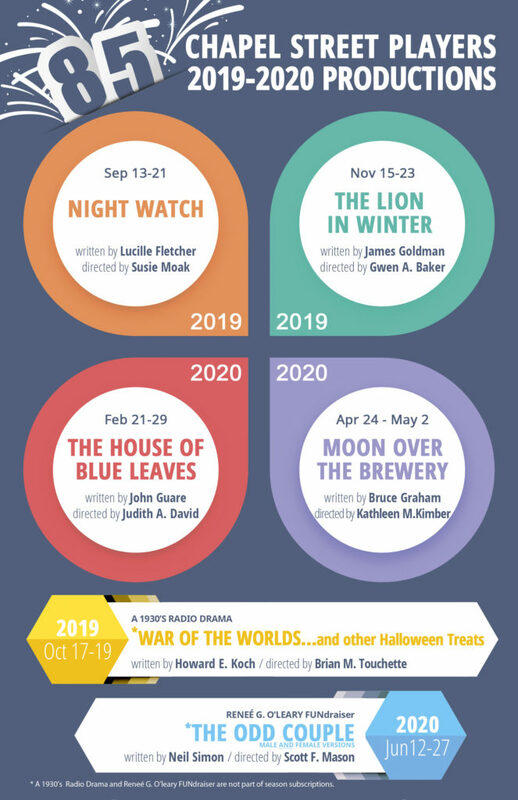 The post 85th Season Announcement appeared first on Chapel Street Players. Directing. You can’t see it, but I am standing in front of my computer, clapping. Bravo Brian Touchette and Susan Boudreaux. The post (Submitted Review) Cuckoo’s Nest appeared first on Chapel Street Players. The post UseMeForHeadline appeared first on Chapel Street Players. 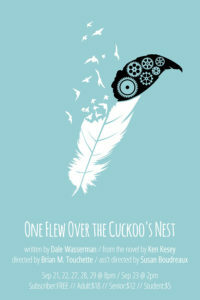 One Flew Over the Cuckoo’s Nest, Dan Wasserman’s stage adaptation of Ken Kesey’s 1962 novel, which premiered on Broadway November 13, 1963 and ran for 82 performances with two revivals (off-Broadway, 1971, and Broadway, 2001) and inspired a film version starring Jack Nicholson, premiered on the Chapel Street Players stage Friday evening. The post (A. Renaldi) You’d be crazy to miss One Flew Over the Cuckoo’s Nest at Chapel Street appeared first on Chapel Street Players. The post (DEArtsInfo)Cuckoo for Chapel Street’s Latest Production appeared first on Chapel Street Players. The post (Submitted Review) Murder On Cue is a well-paced, comedic nod to community theater and mysteries and Clue! appeared first on Chapel Street Players. The post One Flew Over The Cuckoo’s Nest appeared first on Chapel Street Players. “Last night was one of the best if not THE best show I have seen at CSP. Brian casted so perfectly. Great acting and directing. And….You were superb. ” – Marylin P.
These days our lives seem to be encompassed in the little machine that is attached to us at all times and is liable to go off at any time. The post Dead Man’s Cell Phone appeared first on Chapel Street Players. These days our lives seem to be encompassed in the little machine that is attached to us at all times and is liable to go off at any time. How often do we say “My life is in this thing” but don’t really stop to think how true that is. 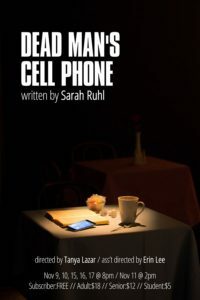 In this comedic look at the ever present technologic wonder of our cell phones that both connect us to and isolate us from the world, Sarah Ruhl shows us how little we know of the human beings who surround us.